I attended AVM as a high school student in 2012. I loved that we got to work with all of the animals that Tufts has on campus! 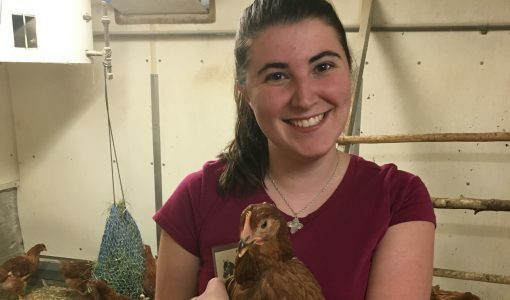 From performing physical exams on the teaching beagles to chasing chickens around the coops to holding piglets at the pig farm, I was exposed to a lot of animals that I had never even considered working with before. I also liked the fact that I got to spend time with students who had the same interests as me and loved animals as much as I do! What are your favorite memories from your AVM experience? My most memorable experience from AVM was my small animal surgery rotation. I had only ever seen small surgeries such as spays or mass removals before, so I was somewhat apprehensive about getting to see something more intense. When I got to the OR, the staff was prepping for a front limb amputation of a boxer. I was so intrigued by observing the surgery and the experience helped to solidify that this truly was what I wanted to do with my life. I think that AVM was one of the most influential experiences in my decision to become a veterinarian. I was pretty sure from a very young age that this is what I wanted to do, but after AVM I was positive. I learned so much in every activity that we did and everything seemed like the most interesting thing I had ever heard. AVM is where I discovered that I was really passionate about animals and knew this was the right decision for me. 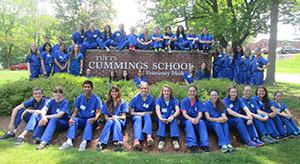 The program is designed to expose you to the many different paths you can take with a veterinary degree. It is extremely eye-opening to see the range of possibilities beyond just clinical practice. Whether you know you want to be a veterinarian or are just considering it, I highly recommend participating in AVM!